The shocks don't stop coming at the Seamaster 2017 ITTF World Tour Qatar Open, with Day Two of the main competition providing yet more unexpected exits from some of the world's top players at the Ali Bin Hamad Al Attiyah Arena on Friday 24th February. Fans were left stunned on the opening day of the main event as China’s Zhang Jike and Ma Long suffered an opening round exit from the Men’s Doubles tournament, and while Ma Long responded well on Day Two with his victory over Qatar’s Li Ping (11-7, 7-11, 11-4, 11-6, 11-9) there was no such joy for Zhang Jike. Drawn in an exciting encounter with Japan’s Koki Niwa, fourth seed Zhang Jike was looking to book his spot in the Men’s Singles quarter-finals. However, unfortunately the Chinese star was forced to withdraw from the tie due to a fever and it is Koki Niwa who progresses to the last eight. One Japanese representative who was involved in action in the Round of 16 was Masaki Yoshida, and his time at the competition will be extended following his eye-catching victory over Germany’s Dimitrij Ovtcharov. Masaki Yoshida, who is the world no.72 in the ITTF World Rankings table for February 2017, was trailing Dimitrij Ovtcharov following the conclusion of game three and there was a strong level of expectation to see the sixth seed Ovtcharov come through the match relatively unscathed. Yet, there was to be no celebration for the Seamaster 2017 ITTF World Tour India Open champion Ovtcharov as his opponent Yoshida claimed three consecutive ends to prevail in six games (11-6, 6-11, 4-11, 11-7, 11-9, 11-8). “At the beginning of the match, he was so strong from the backhand, so I changed my tactic… I tried to return the service positively by using the banana return. For sure this is the highest ranked player I have ever beaten”, Masaki Yoshida. Awaiting Masaki Yoshida in the quarter-finals is Fan Zhendong of China after the second seed calmly saw off Spain’s Alvaro Robles in the lower half of the draw (11-6, 11-8, 11-8, 12-10), but there is no place in the next round for the no.3 seed Xu Xin who lost out to fellow Chinese representative Fang Bo (11-6, 11-7, 14-12, 4-11, 4-11, 13-11). Another big shock came in the Women’s Singles draw as the top seed Zhu Yuling exited the competition to Germany’s Shan Xiaona in the Round of 16. Zhu Yuling faced the 16th seed in the top half of the draw, and the aggressive pen-hold grip style from Shan Xiaona proved too hot to handle for the top seed (11-8, 6-11, 11-9, 12-10, 11-7) as the German player waltzed into the quarter-finals. “I think I played well against Zhu Yuling today, my receive of her serves was good. 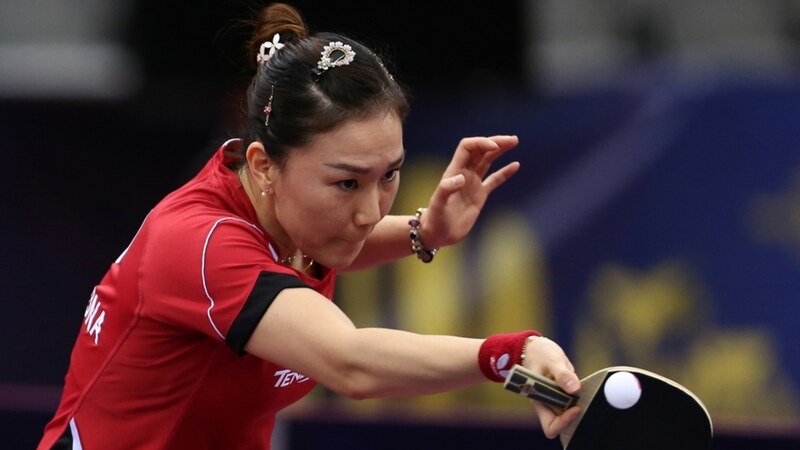 She was slower getting into the game as well and wasn’t playing her best level…”, Shan Xiaona. Victory for Germany over China in one encounter, but a very different outcome unfolded in Han Ying’s match against Chen Meng. The no.5 seed Han Ying of Germany was eliminated in six games by the ninth seeded player Chen Meng (7-11, 11-6, 11-6, 11-13, 11-5, 11-4), with the Chinese competitor moving through to take on Cheng I-Ching of Chinese Taipei in the quarter-finals following her triumph over Japan’s Misaki Morizono (8-11, 11-7, 11-5, 11-4, 12-10).